The AR500 Armor® Weighted Training Plates are constructed from military grade ½” MIL-A 46100 steel plate. You will be passing these training plates down for generations, we guarantee it. 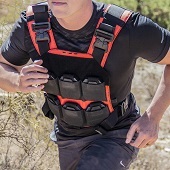 Available in a 10lb, and 15lb version, our Training Plates fit all plate carriers designed to accept 10” x 12” body armor or larger, and are fully compatible with our Atlas Adjustable Weight Fitness Plate Carrier. Ergonomically designed to mimic armor by form of a common shooters cut. Improved with an upper relief cut for better mobility while using a plate carrier during training and workouts. Each training plate is coated with the same base coat as all AR500 Armor® Body Armor providing protection against the elements, making them water and abrasion resistant.